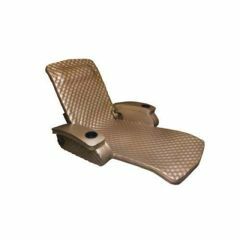 The Super Soft® Adjustable Recliner is perfect for when a leisurely day in the pool is just what you need, look no further than the Super Soft Adjustable Recliner by Texas Recreation. The double thick layers of soft, closed-cell vinyl-coated foam work together with an internal steel frame to provide unmatched durability. No more sinking or struggling to stay upright. 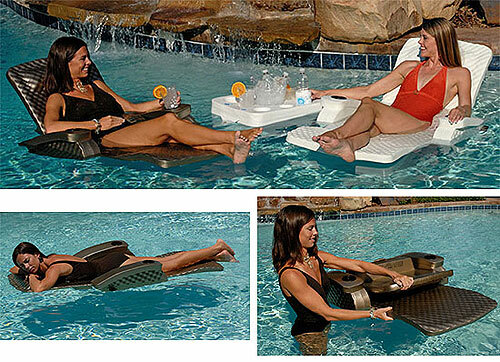 This pool recliner keeps you buoyant and comfortable. With the turn of a knob, you can have an upright chair, full-length float, or a multi-position recliner. The built-in head rest and recessed cup holders provide you with all the comforts you need for a day of relaxation. Heavy brass tie-off grommet allows for easy storage. easly to handle. easily to handle. easily to handle. easily to handle. not too bulkey. easy storage. I use it in my pool. I like the fact that it is adjustable and can also be used flat. The quality seems good. Things that aren't so great is the cup holders are just to shallow and doesn't hold cans, bottles or glasses securely. Also, my husband weighs quite a bit more than I do and can't use the chaise at all. It sinks below the water and is very unstable.